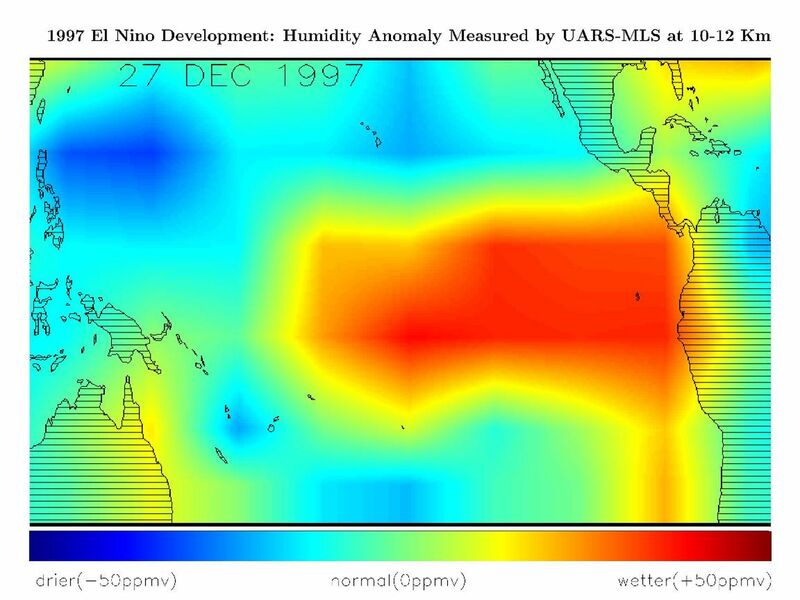 This image shows differences in atmospheric water vapor relative to a normal (average) year in the Earth's upper troposphere about 10 kilometers (6 miles) above the surface. The measurements were taken by the Microwave Limb Sounder (MLS) instrument aboard NASA's Upper Atmosphere Research Satellite (UARS). These data, collected in late December 1997, show higher than normal levels of water vapor (red) over the central and eastern Pacific which indicates the presence of an El NiÃ±o condition. At the same time, the western Pacific (blue) is much drier than normal. The unusually moist air above the central and eastern Pacific is a consequence of the much warmer-than-normal ocean waters which occur during El NiÃ±o. Warmer water evaporates at a higher rate and the resulting warm moist air rises and forms tall cloud towers. In the tropics, the warm water and the resulting tall cloud towers typically produce large amounts of rain. These data show significant increases in the amount of atmospheric moisture off the coast of Peru and Ecuador since measurements were made in November 1997. 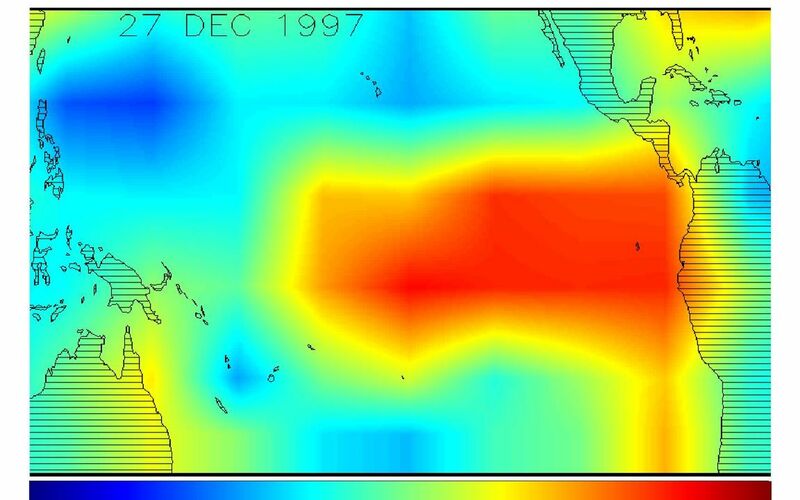 The maximum water temperature in the eastern tropical Pacific, as measured by the National Oceanic and Atmospheric Administration (NOAA), is still higher than normal and these high ocean temperatures are likely responsible for an increase in evaporation and the subsequent rise in humidity.